If you’ve been following our blog you’ll know that our outings are dictated by our ever-growing stack of Scoopon and Living Social deals. 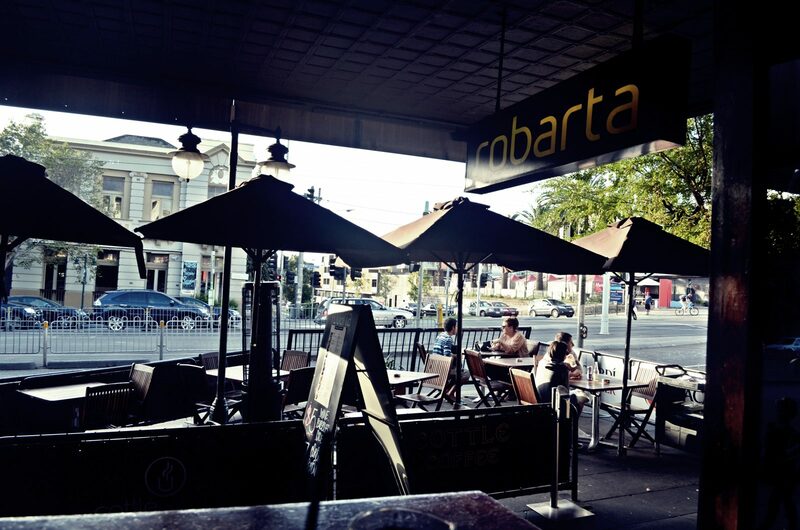 The latest, of which, brought us to Robarta on Fitzroy Street in Saint Kilda. Ranging from 3.5 to 4.5 stars — depending on your restaurant review site of choice — I had high expectations. Thankfully this trendy tapas bar lived up to its reputation. We had an early booking on a Sunday evening so had our choice of tables. We sat at a high top that looked out onto Fitzroy (gotta’ love Melbourne’s open-air dining). Once seated we were immediately greeted by a pleasant gent who was a lovely balance of attentive-but-not-intrusive the whole meal. With our Scoopon deal we started with a bowl of Miso soup each. It was yummy and just a tad on the salty side, which Ryan loved. We were off to a great start. We ordered four tapas, mainly staying with an Asian theme. The Garlic Chicken with sweet and sour sauce came out first with the chicken and pork spring rolls, along with the complementary fried rice. 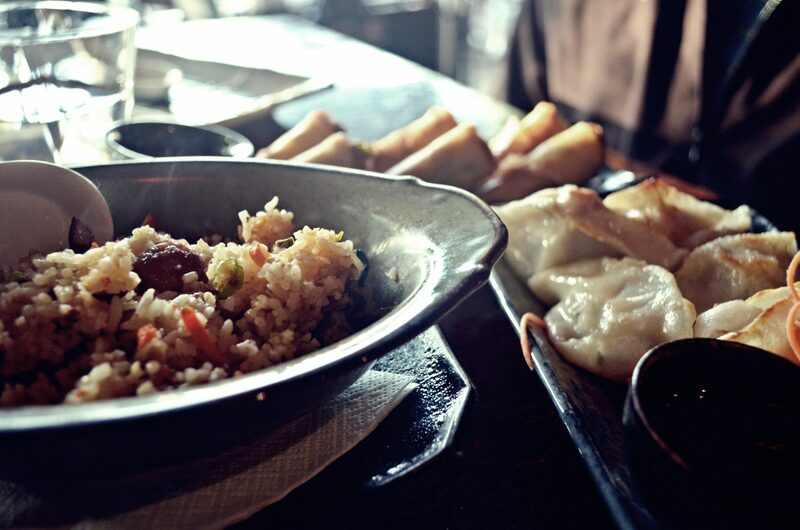 These dishes were quickly followed by the Shanghai dumplings and spiced chicken wings. Each dish was surprising, in a good way. The chicken wings had a dipping sauce that I likened to an upscale version of A1 steak sauce and Ryan nearly licked the little bowl clean. At first bite, the fried rice is pretty ordinary but the more you have, the more you taste special something. It’s not earth-shattering gourmet cuisine but it’s good, bordering on very good. We were happy with the tapas and comfortably full. But we would not have missed the dessert, which was, by far the highlight of the meal. It’s not odd that I would say that about a dessert because I believe that ending dinner on a sweet note is imperative but my dear hubs is not a slave to his sweet tooth like I am and even he agreed that the desserts were the best part. Included with our deal was two desserts of choice. We went with a lovely White Chocolate Panna Cotta which is described on the menu as “light, silky smooth cream and white chocolate custard with seasonal fruits and a drizzle of sticky red wine syrup”. 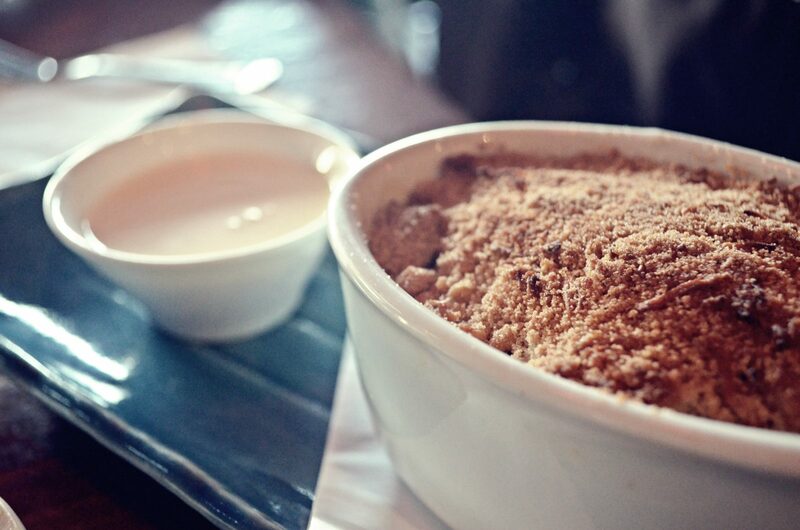 We also chose the Apple Mango Coconut Crumble which can only be described as “yuummmmmmm”. Ryan also enjoyed dessert with a latte which we — as emerging coffee snobs — can say was very well done. The Scoopon deal made this little spot very affordable but even without it, we’ll be back to Robarta.